As one adventure ends, another one begins. So too have our intrepid heroes here at Soulbound Studios headed out on their next set of quests. That said, our latest quests are tightly connected to the quests of the previous adventure. You might call them quest chains. So if you haven't already, read over the previous adventure completion blog to make sure you're all caught up with where we are now. As with any good story, the actors will no doubt tackle several side quests over the course of the upcoming adventure. But, while they may temporarily split apart to take care of independent work, the focus of this upcoming adventure revolves solidly around the completion of three main quests. Let's take a deeper look at our quest descriptions. As discussed in our previous blog post, Release 0.4.0 focused around the creation of many new features and features areas. In Release 0.5.0, the designers and engineers will build upon the work done in 0.4.0 by assembling those new systems into the client code base, as well as implementing mechanics that received re-designs and iterations during 0.4.0. I can't convey how happy this makes me. Our little team has worked hard to get here and I'm extremely proud of them. Of course, these aren't the only features we'll be working on in 0.5.0. There are still a few more that need to be implemented as well as integrated. As we discussed in the Adventure 0.4.0 completion blog, there were several systems that got re-designs, and a few others that began their first implementation. We will continue development of those in the upcoming release. 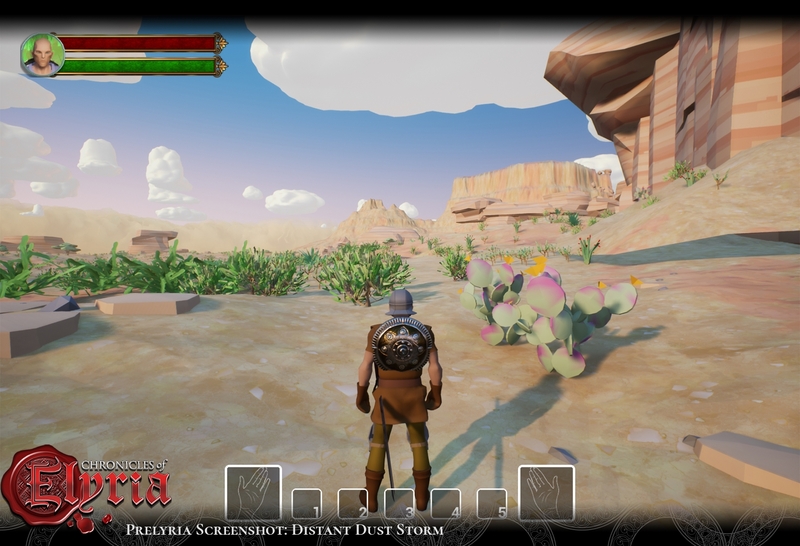 In particular, there is the updated skill system, the updated combat system, the new information and knowledge system, and the new personal destiny system. Of particular interest is the combat system. We've known for a while that, while combat isn't necessarily a main focus of CoE for everyone, it's no doubt an area of great interest to many of our players and certainly has a huge impact on the world. While using weapons isn't the only form of PvP in CoE, it's likely the most direct and well understood. That's why it's important we get it right. We've gone through a few different iterations of our combat system already during the development of CoE and, in Release 0.4.0, we began prototyping and implementation of our newest (and hopefully final) combat system. Stay tuned for the update and release blogs to check out the new combat mechanics. Finally, Release 0.4.0 saw the first implementation of the personal destiny system and, in release 0.5.0, we'll be taking the work we did previously and using it to drive the needs and goals of the NPCs in the world in order to create spontaneous story arcs. With the transition away from the web-based VoxElyria client to the UE4-based Prelyria client, we now only need to support UE4. That means we can safely transition away from web-based UI technologies to UMG, the Unreal Engine's native UI framework. Of course, this does come with some re-implementation, but in the long run, being able to use UMG directly should provide us a bit more power over having all our UI being HTML/CSS-driven. While the designers and engineers are hard at work implementing and assembling systems and designs, the art and sound guilds will be working on creating new content for the world. This includes new Prelyria-styled models, new animations, sounds & sound effects (usable in both Prelyria and CoE), and new environments. One of the neat things about the Prelyria art-style is it allows bi-directional migration of assets during development. For example, we can take assets we've already created in CoE and lower their complexity to something suitable for the pre-Alpha client. Conversely we can use the low-poly versions developed during the pre-Alpha as "gray-box" assets in the official CoE client. 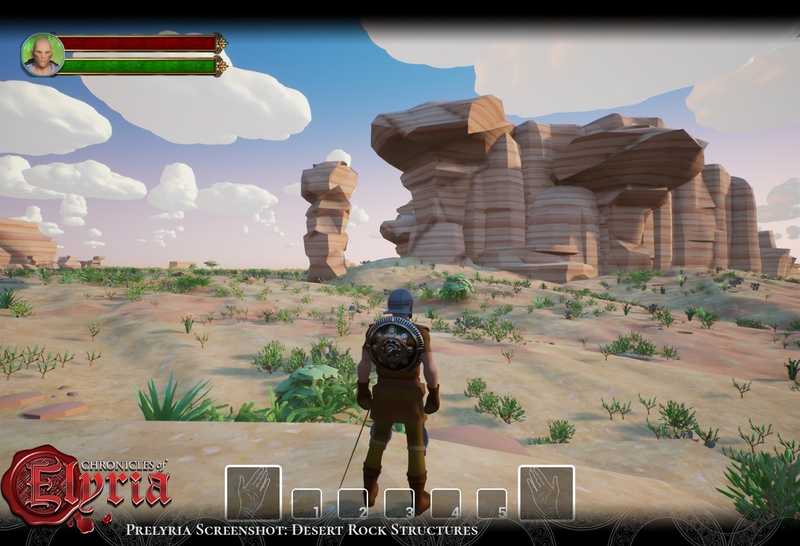 Ideally, moving from pre-Alpha to Alpha for the content team will predominantly be an organized asset swap, moving from low-poly to high-poly models, low bone count to high-bone count rigs, and from simple materials and shaders to our more complex ones. 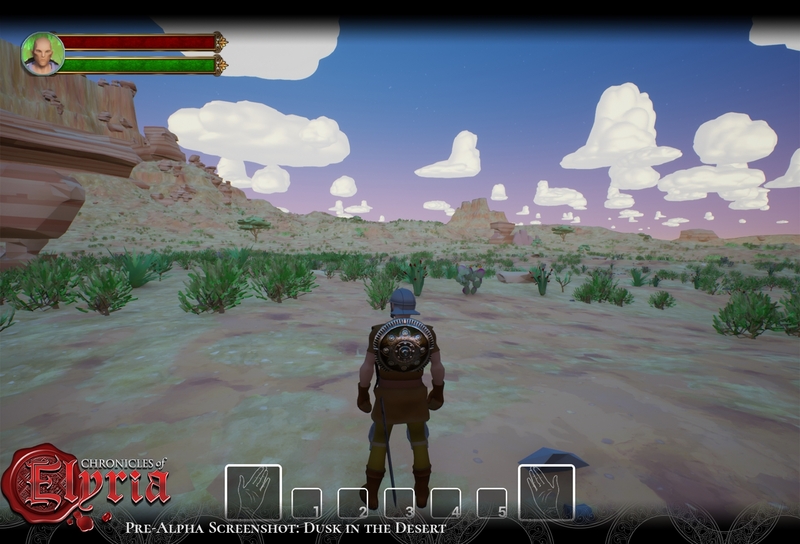 That all said, our focus in Release 0.5.0 is to create more of the world for players to explore during the pre-Alpha. 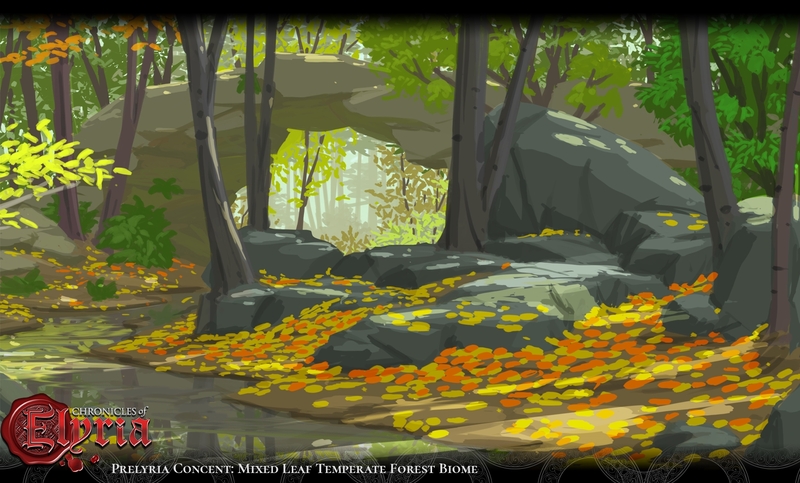 We've chosen three biomes as the first to let players explore during testing. 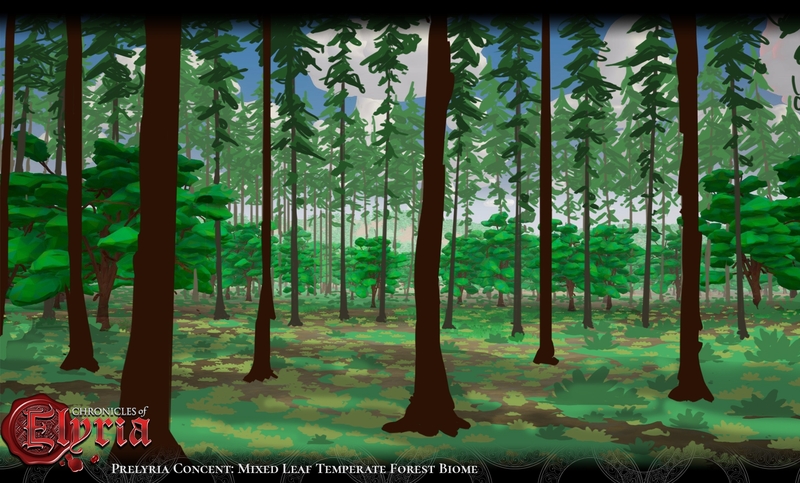 These are the Freshwater Wetlands, Semi-Arid Desert, and Mixed-Leaf Temperate Forest biomes. You already saw both concepts and screenshots of the wetlands in the 0.4.0 completion blog, as well as some concepts of the Semi-Arid desert. Here are a few more to whet your appetite while you wait for the mid-adventure and adventure completion blogs. World Generation is no small task, and is something we've been working on continuously for the better part of the project. But with pre-Alpha once again visible in the distance, and Map Voting and Domain & Settlement Selection rapidly approaching, our need to procedurally create the continents, settlements, buildings, and points of interest has never been higher. So in Release 0.5.0 myself, Souzou, and Raevantiel will be finishing a significant portion of the procedural world-building mechanics in preparation for the launch of Map Voting. And when is Map Voting, you may ask? Well, as promised in the Release 0.4.0 completion blog, the release of Map Voting is just around the corner. While the news and announcement post containing the final rules and information on the map voting process will be published a few days ahead of it on the 18th, Map Voting itself will begin the 22nd... of October. So, you know, soon™. Back at the beginning of Release 0.4.0 I said releases 4 and 5 would be the most significant of our entire development process. I stand by those words. 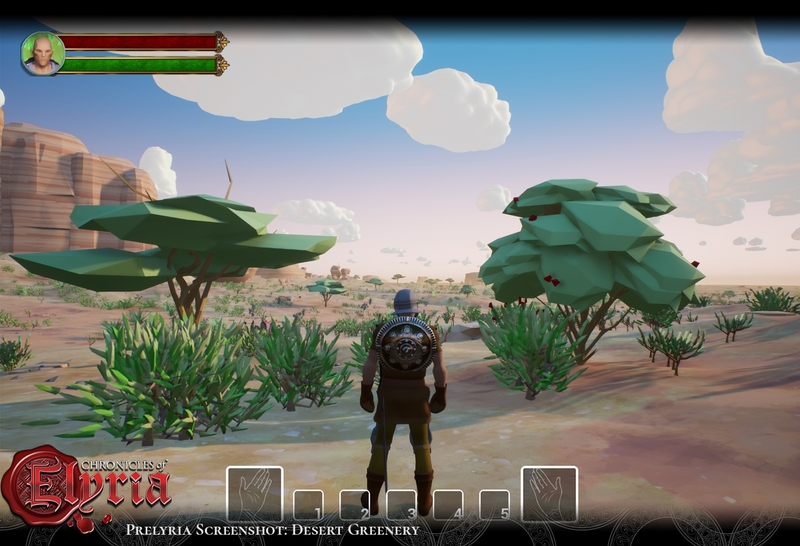 The previous release was all about creating the systems and features necessary to make the world feel functional, and to give the alpha testers something to actually test in pre-Alpha. 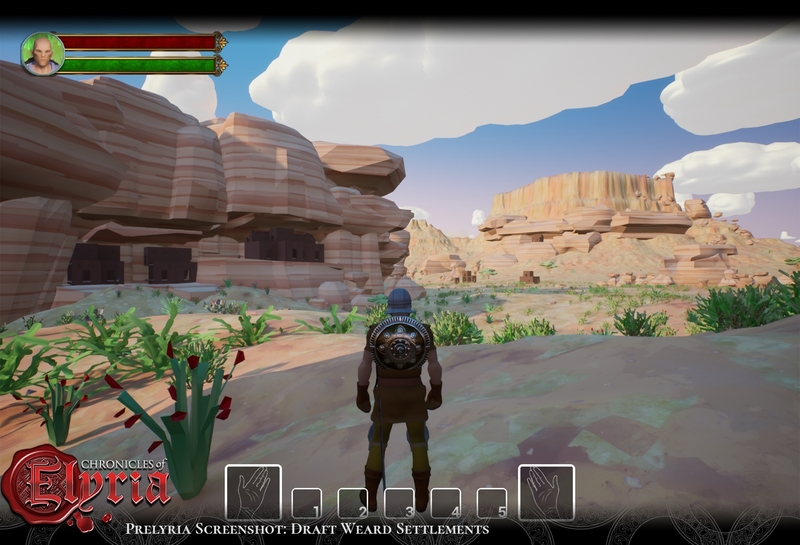 Release 0.5.0 is all about getting those features assembled into the new client, finishing up development of combat and similar key systems, and fleshing out the world with our new procedural world-building tools. All of this is so there's content and mechanics for our earliest testers to explore. At the end of Release 0.5.0, the game will have finally begun to take shape. Each of those "parts" we talked about at the conclusion of Release 0.4.0 will have been manufactured, assembled, and snapped into place, and the game will finally be playable. And if that's not enough, Map Voting, which begins in just over two short weeks, will give everyone in the CoE community an opportunity to influence the future of their world, by participating in a democratic vote for the starting continents of the servers. The next couple of months will no doubt prove to be an exciting, active, and influential time in the development of Chronicles of Elyria. Let the adventure begin! Yes! Map voting! Now I just have to figure out what server Texas is on. Also, the screen shots remind me if Conan Exiles, too. So, to the person who mentioned that, you're not the only one. Yes! Map voting! Now I just have to figure out what server Texas is on. Also, the screen shots remind me if Conan Exiles, too. So, to the person who mentioned that, you're not the only one. Nice ! I only wish i heard of CoE earlier so i could have got Pre-Alpha and Alpha 1 access. Missed Alpha 1 by one day. Hey Caspian want some more money how about selling me access to all thos testing phases? :) Cheers! Nice ! I only wish i heard of CoE earlier so i could have got Pre-Alpha and Alpha 1 access. Missed Alpha 1 by one day. Hey Caspian want some more money how about selling me access to all thos testing phases? :) Cheers! While the news and announcement post containing the final rules and information on the map voting process will be published a few days ahead of it on the 18th, Map Voting itself will begin the 22nd... of October. So, you know, soon™. And would I be hoping for too much to begin dreaming of a Prelyria Christmas? Finally a date for map voting! Yay! It's the first project I'm following and I'm supporting. And I like it more and more! All of the screenshots give off a weird Conan Exiles vibe, not sure if I like it or not. I just wanted to check to be completely clear because I can often misunderstand things: is the Map Voting date still tentative or is the 22nd pretty much definite now that this blog piece has been posted? Either way, this is all very exciting! I just wanted to check to be completely clear because I can often misunderstand things: is the Map Voting date still tentative or is the 22nd pretty much definite now that this blog piece has been posted? Either way, this is all very exciting! Nice one! How long can we vote for the maps? The 18th we will get all our question answered . I'm finally getting close to being able to "see" my lands. This has been the biggest thing holding my partner back from being as excited as I am to see the game coming to life. With map voting, domain selection, and the release of Prelyria, it will finally feel less like packing for a journey, and instead feel like we have finally commenced our part in the epic adventure. I'm finally getting close to being able to "see" my lands. This has been the biggest thing holding my partner back from being as excited as I am to see the game coming to life. With map voting, domain selection, and the release of Prelyria, it will finally feel less like packing for a journey, and instead feel like we have finally commenced our part in the epic adventure. I am less exited about map voting (I think no matter what my server decides the game will look amazing for someone who is used detail levels of Lotro on an MMO game), but more about the client. Can we, maybe, see some prerecorded gameplay footage when the client is ready for alpha? maybe commented by you guys? that would be amazing. Excited to see map voting, can only hope it really does happen. While nothing unexpected comes up. I'm so impressed by the depth of your commitment and planning in all this, Caspian - and the whole of SBS. Awesome job. Speechless. map voting so soon. Finally we can plan on solid ground. It looks a bit like a standalone game (which makes me nervous for many reasons), and I have my other worries... but it does look fantastic and I really gotta say... be proud Caspian. Your team is awesome, you're still dedicated and the world is looking fuller and fuller each pass over. Keep up this refreshing standard of work and communication, its one of the few motes of light that exist in an increasingly din industry. It looks a bit like a standalone game (which makes me nervous for many reasons), and I have my other worries... but it does look fantastic and I really gotta say... be proud Caspian. Your team is awesome, you're still dedicated and the world is looking fuller and fuller each pass over. Keep up this refreshing standard of work and communication, its one of the few motes of light that exist in an increasingly din industry. I'm soooo over the debates on "what if" regarding the lands we are going to be in. Map selection, finally! Let's get something solid under our feet to talk about. Like VioletWinterlynn and Kou, I'd also want both. And not just for the slick low-poly graphics. As I do not yet have a PC that meets the requirements to run the planned finished product, I'd be very happy if SBS could and would somehow support players using 'low-poly Prelyria local client settings'. I can imagine more (potential) players would appreciate that. Apart from the technical limitations, it may even provide a very interesting business case for SBS if they could pull that off. Think many players with limited funds and old PCs. Posted By **NiHZ** at 02:14 AM - Sat Oct 06 2018 > > Am I the only one who loves the prelyria style and wishes CoE went in that direction instead of the super-realism? oAo Like VioletWinterlynn and Kou, I'd also want both. And not just for the slick low-poly graphics. As I do not yet have a PC that meets the requirements to run the planned finished product, I'd be very happy if SBS could and would somehow support players using 'low-poly Prelyria local client settings'. I can imagine more (potential) players would appreciate that. Apart from the technical limitations, it may even provide a very interesting business case for SBS if they could pull that off. Think many players with limited funds and old PCs. Thank you, great update! Keep up your good work! Looking forward to map selection and Prelyria. The graphic is simple yet beautiful, I love the look of it. Thank you, great update! Keep up your good work! Looking forward to map selection and Prelyria. The graphic is simple yet beautiful, I love the look of it. i love the artstyle so much!!! i wish we could have both! Posted By **NiHZ** at 6:14 PM - Fri Oct 05 2018 > > Am I the only one who loves the prelyria style and wishes CoE went in that direction instead of the super-realism? oAo i love the artstyle so much!!! i wish we could have both! So exciting. Definitely digging the art style for Prelyria. Well that just raised my hype meter even higher. I'm so excited for 0.5.0. Its such a great time to be an Elyrian! Map Voting happening this month is just icing on the cake! Extremely excited for the update, my short time in the community doesn't diminish the anticipation. Keep it up and get it done! Yay! Great update, thank you. awesome stuff , thank you SBS. awesome stuff , thank you SBS. MANY HANDS MAKE LIGHT WORK.